The main cause of concern is to ensure quality across all educational institutions. Bringing all of them together towards a particular strategy is not an easy task. India holds an important place in the global education industry. The country has more than 1.4 million schools with over 227 million students enrolled and more than 36,000 higher education institutes. India has the third largest higher education systems in the world. However, there is still a lot of potential for further development in the education system. India has become the second largest market for e-learning after the US. The sector is currently pegged at $ 2-3 billion, which is expected to touch $ 40 billion by 2017. The distance education market in India is expected to grow at a Compound Annual Growth Rate (CAGR) of around 34 per cent during 2013-14 to 2017-18. Moreover, the aim of the government to raise its current gross enrolment ratio to 30 per cent by 2020 will also boost the growth of the distance education in India. 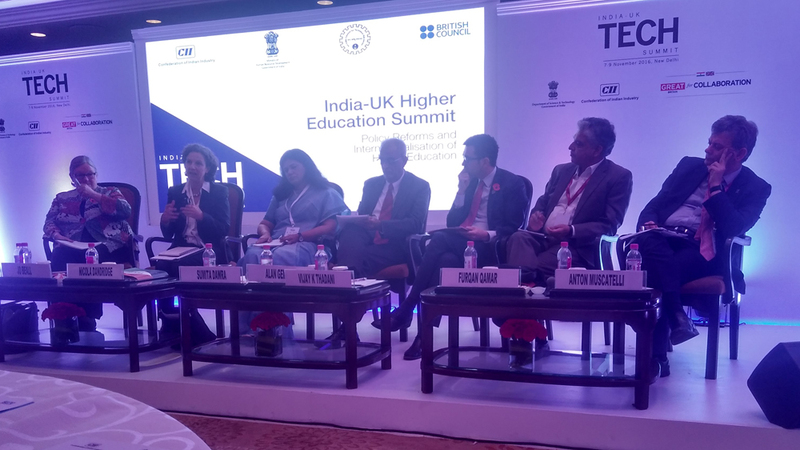 At the India-UK Higher Education Summit on Higher Education Policy Reforms & Internationalisation, some of the bigwigs of the education sector in India and UK including Prof. Furqan Qamar, Secretary General, Association of Indian Universities; Prof. Anton Muscatelli, Vice Chancellor, University of Glasgow; Dr. Jo Beall, Director Education and Society, British Council; Sumita Dawra, IAS, Principal Secretary- Higher education, Government of Andhra Pradesh; Prof. Nicola Dandridge, Chief Executive, Universities UK; Alan Gemmell OBE, Director, British council India and Vijay K Thadani,, Chairman, CII National Committee on Higher education &Vice Chairman & Managing Director, NIIT Ltd spoke on how policy reforms can be used to transform education quality. The overall scenario of higher education in India does not match with the global standards. Hence, there is a need for an increased assessment of the Quality of the country’s educational institutions. Traditionally, these institutions assumed that Quality could be determined by their internal resources, namely faculty with an impressive set of degrees, number of books and journals in the library, an ultra-modern campus, and size of the endowment, etc., or by its definable and assessable outputs, like efficient use of resources, producing uniquely educated, highly satisfied and employable graduates. This “value-addition” approach, does not measure the competencies students develop through the courses offered. The competencies are recall, understanding, and problem solving. “There is also a need to upgrade our infrastructure and give freedom to operate to the concerned departments,” he further added. Thus, policy reforms are very important for improving the quality of education. Tie-ups of organisations with universities for research are highly likely to bring about changes in education all over the world. Should edupreneurs invest in image consultants?.. Apollo Tyres "Drives" Into Top 100 Franchise..
Food Business Is a Lucrative Franchise Option..